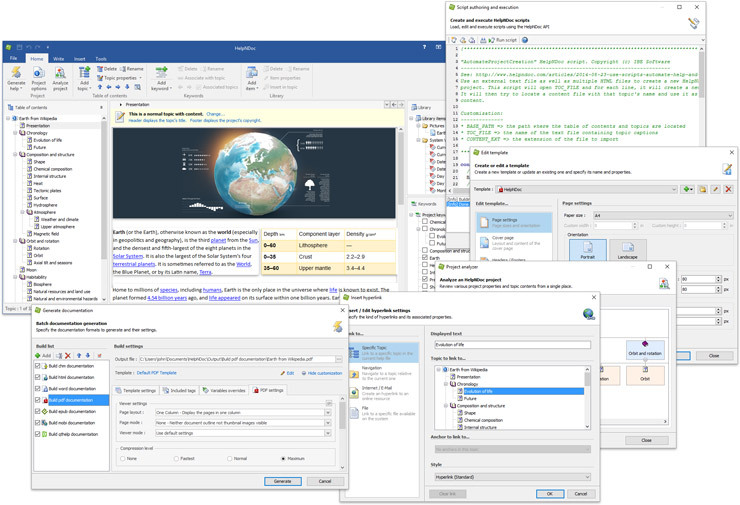 We are thrilled to announce the immediate availability of HelpNDoc 5.0, a major update of the popular help authoring tool which can be downloaded completely free for personal use and evaluation purposes. This new update includes a redesigned user interface, a completely rewritten responsive HTML template and much, much more. Read on to learn more and download your free version of HelpNDoc now. HelpNDoc's default HTML template has been rewritten from the ground up to use the latest web technologies and produce responsive HTML documentation web sites compatible with any screen sizes and devices. To overcome most web browser's security restrictions when browsing local content, HelpNDoc now includes a full featured HTTP Server: it is therefore possible to test your HTML documentation as it will appear when uploaded to a web-server. This new version also includes a redesigned iOS HTML template, compatible with the iPhone and the iPad and using the latest iOS look and feel. It also features an update jQuery mobile template compatible with all Android devices and the vast majority of mobile phones and tablets. Because this is where you are spending most of your time, HelpNDoc's user interface has been re-designed to be more accessible and readable. Following the steps of the latest Microsoft Office version, we have redesigned HelpNDoc's user interface. 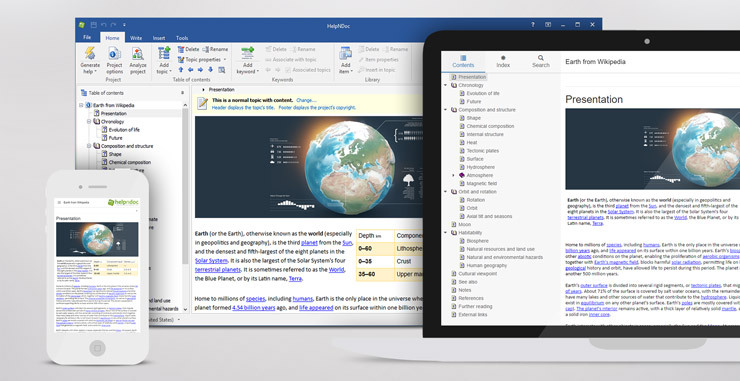 It now includes a modern, clean and readable look and feel, with the usual contextual ribbon bar, providing quick access to all HelpNDoc features. We have speed up HelpNDoc's starting time and enhanced RSS feed handling on the welcome page to avoid random errors. HelpNDoc's project file format has been optimized and will result in faster saving and loading time. Projects are now locked to avoid being opened simultaneously in multiple instances of HelpNDoc. 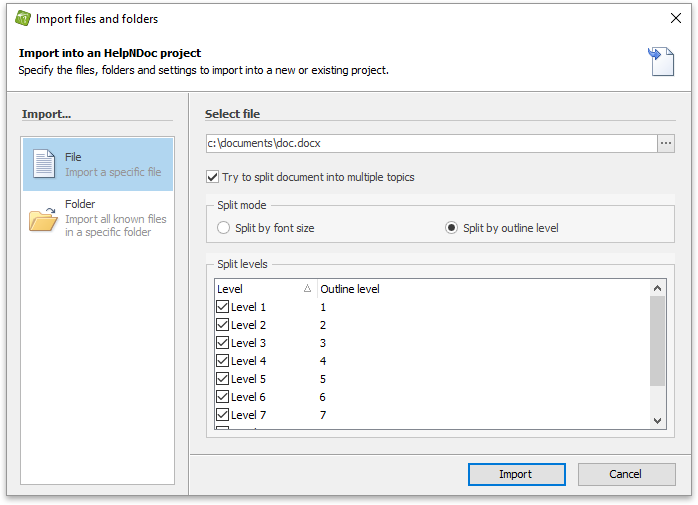 HelpNDoc's topic editor has seen many enhancements including in tables, image resizing for high DPI screens... while the project analyzer has been simplified to provide easy access to filters and actions and better report topics linked to keywords. HelpNDoc's Word and HTML importers have been enhanced and can now split files into multiple topics. It is possible to split them by font size or outline level so that a single document can produce complete projects with a complex table of contents. With this 5th major update, we continue the work we've started more than 10 years ago: help you "enjoy documenting". This wouldn't have been possible without the continued support of all HelpNDoc users, providing valuable feedback and praises throughout the years. We would like to thank you for that! We will continue to work hard to enhance HelpNDoc and make sure your documentation, help, eBook... writing process is as fast, easy and enjoyable as possible. Do not hesitate to contact us to share your thoughts about HelpNDoc. If you haven't downloaded HelpNDoc yet, please know that it is completely free and fully functional for personal use and evaluation purposes. So download your copy today and enjoy documenting!